This is a sponsored post by Eve Thompson of Reston Real Estate. It does not reflect the view of Reston Now. Golf course living is not a new concept in Reston. In the early 1970s, developers incorporated townhome communities into the Reston National Golf Course‘s design. Golf Course View Cluster is one of these lovely communities. The 200 townhomes that comprise Golf Course View Cluster (Golf Course View and Golf Course Square) are situated in the middle of the golf course, surrounded by wooded areas. The units are primarily three bedrooms, although each end unit has four bedrooms. The residents take tremendous pride their neighborhood and their homes, creating a safe and welcoming community. This is a neighborhood to consider if you want to know your neighbors. In addition to being surrounded by the golf course, it’s just a short hop over to the Newbridge Recreation Area — with its swimming pool, tennis courts and basketball court. 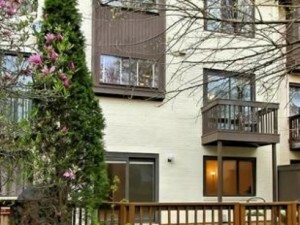 Located at the end of Golf Course Drive — off of Soapstone Road (at the Sunrise Valley Drive intersection) — in South Reston, the neighborhood is about one-half mile to the Wiehle-Reston East Metro Station. If you need to drive, it’s just a short hop to the Dulles Toll Road. And, of course, the miles of Reston trails, Reston Town Center, and South Lakes Village Center are also close.